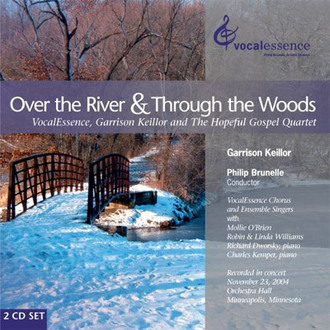 On November 23, 2004, the Hopeful Gospel Quartet — Garrison Keillor, Mollie O’Brien and Robin & Linda Williams — traded musical moments with the VocalEssence Chorus and Ensemble Singers in a concert at Orchestra Hall, Minneapolis. The evening seamlessly blended American folk traditions with choral masterpieces old and new, from “Will the Circle Be Unbroken” to “Now Thank We All Our God.” Garrison Keillor shared his Thanksgiving memories in a hilarious yet poignant monologue. Thanks to Minnesota Public Radio, the evening was captured for posterity in this charming two-CD set.